Southwest Chamber Music was sponsored by the U.S. State Department for the largest cultural exchange in history between the United States and Vietnam. Ascending Dragon Music Festival and Cultural Exchange was a six week cultural exchange that brought 19 Americans to Vietnam in March 2010, and 19 Vietnamese to the U.S. in April-May 2010, each for three weeks. Click here to view photos from Vietnam on our Facebook Fan Page. 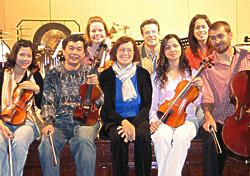 Grammy® Award-winning Southwest Chamber Music performed at the prestigious Guadalajara FIL Arts Festival, Mexico in December 2009, representing the festival's guest of honor Los Angeles, with sponsorship from the NEA and the Cultural Affairs Department of the City of Los Angeles. We collaborated with internationally renowned and Grammy Award-nominated Tambuco Percussion Ensemble of Mexico City and soprano Suzanna Guzmán, in a program featuring Mexican and American composers, Carlos Chávez, Aaron Copland, John Adams, and William Kraft. This program highlights the strong cultural ties between the United States and Mexico, demonstrated by the lifelong friendship between Chávez and Copland and in the working relationship between Tambuco Percussion Ensemble and composer William Kraft that go back many decades. 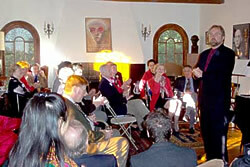 Southwest Chamber Music collaborated with Tambuco in the Grammy-nominated recording of works by Chávez at the suggestion of Kraft. 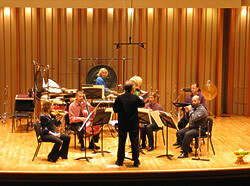 Southwest Chamber Music performed in May 2007 at the UNAM Center in Mexico City with a cycle of five concerts of the complete chamber works of Carlos Chávez. 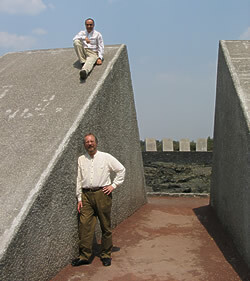 Two-time GRAMMY-winner Southwest Chamber Music closed its 20th Anniversary Season with a historic five-concert tour to Mexico City from May 23rd to May 28th, 2007. These performances- hosted by the most prestigious arts presenter in Mexico, the Universidad Nacional Autonomia de Mexico (UNAM)- constituted the first complete cycle of chamber music by Carlos Chávez in the history of Mexico. This project reunited Southwest Chamber Music with the Grammy-nominated Tambuco Percussion Ensemble of Mexico City. The five concerts surveyed music from 1919 to 1974 and covered chamber music works for strings, winds, brass, percussion, piano, and voice. In December 2006, Southwest Chamber Music was the first American ensemble-in-residence to begin a long term residency and cultural exchange program with the Royal University of Fine Arts in Phnom Penh, Cambodia, and the Hanoi National Conservatory of Music in Vietnam. In December 2006, Southwest Chamber Music was the first American ensemble-in-residence to perform and teach at the Hanoi National Conservatory in Vietnam as part of the Conservatory’s 50th anniversary celebration. Southwest Chamber Music’s musicians taught and interacted with over 100 students and faculty members at the Conservatory. “The two concerts in Hanoi were one of the most spirited and inspirational in Southwest Chamber Music’s career”, say Founding Directors Jeff von der Schmidt and Jan Karlin. 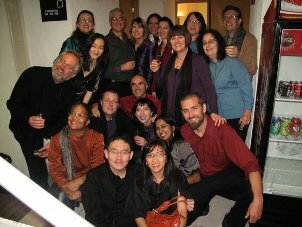 Artistic Director Jeff von der Schmidt prepared a varied world program that symbolizes the cultural bridges possible through music, with the Asian tinged aesthetics of John Cage and Lou Harrison supported by a glance toward the Indochine of France’s Maurice Ravel, and included the Grawemeyer Award-winning composer Chinary Ung’s powerful Oracle. The ensemble also performed a work that uses very popular Vietnamese folkloric song by composer Phuc Linh, which received its American premiere at Southwest’s 2007 Summer Festival at The Huntington. The solemn Adagio for Strings by Samuel Barber made many audience members shed tears with its wartime association. The melodic Mozart Clarinet Quintet ended the program with celebration. The concert activities of Southwest Chamber Music in Cambodia featured the first professional performances in Phnom Penh and Siem Reap of the music of Southeast Asia’s most accomplished musician, Grawemeyer Award-winning composer Chinary Ung. The ensemble was also the only American organization represented by a performance at the 2006 World Culture Expo in Siem Reap, Cambodia, following a performance and Master Classes in Phnom Penh for the Royal University of Fine Arts. These performances constituted the most significant musical activity in Cambodia since the end of the Khmer Rouge Era. Works by Cambodian and Vietnamese composers will be presented in subsequent seasons at concerts and educational events throughout Southern California. Southwest Chamber Music performed An American Decameron, a collaboration between composer Richard Felciano and noted author Studs Terkel at the Library of Congress. Southwest Chamber Music traveled to Washington D.C. to perform at the Library of Congress with a concert of Richard Felicano’s An American Decameron. Commissioned by the Serge and Natalie Koussevitsky Fund at the Library of Congress, An American Decameron is a collaboration between Felciano and noted author Studs Terkel, whose observations of the American scene offer a very upbeat look at the world we experience. Concert Program at Library of Congress, Washington D.C.
Southwest Chamber Music made its New York debut in two concerts at Cooper Union in programs surveying the complete Los Angeles chamber music by Arnold Schoenberg. After a successful set of concerts in New York City, Southwest Chamber Music became the first American ensemble to perform at the Arnold Schoenberg Center in Vienna. 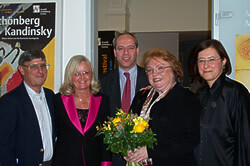 This week long residency at the Schoenberg Center in Vienna included all of the chamber music Schoenberg composed in Los Angeles, Pierrot Lunaire (the only work he recorded as a conductor of his music, which was also done in Los Angeles) and his arrangement of The Emperor Waltz, which he made for a tour with Pierrot Lunaire in the 1920s. At Schoenberg’s home in Mödling, where Schoenberg developed the twelve tone technique, members of Southwest Chamber Music performed works by Schoenberg’s most important American students, John Cage and Lou Harrison, as well as Elliott Carter, Stephen L. Mosko, and Milton Babbitt. During a week long residency at the Arnold Schoenberg Center in Vienna, Southwest Chamber Music became the first American ensemble to perform there. Our musicians studied or coached with the first generation of Schoenberg disciples.